HF: “Tai O Market Street (大澳街市街) has been, and still is, the busiest economic centre of Tai O. Several old buildings still remain along the Street, with Nos. 1, 7, 9, 11, 13 and 17 lying on the west side, and Nos. 2, 4 and 14 along its east side. The one at No. 1 stands on a land lot (D.D. 302 Lot 338 Section A) at the front of the Street. The part of Tai O Market Street near the creek was built on the land reclaimed in 1930. Although it is not known when the lot was first built on, judging from their appearance the existing building is believed to have been constructed in the early 1930s. 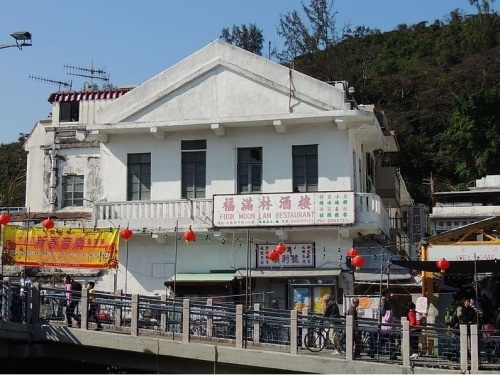 Thus, it was one of the first buildings ever constructed on the reclaimed land of Tai O Market Street. The land lot on which this building stands is held under New Grant Lease which can be dated to the early 1930s. The early lessees of the lot were Yun Wing Kin (阮永堅) and Yun Wing Nin (阮永年) as beneficiaries with Yun Lam Shi (阮林氏) – possibly their mother – as trustee. Interestingly, the lot and the premises thereon have been owned by the Yun/Yuen (阮) family throughout. Photographs from the 1950s show that it was the site of a timber yard, and a Chinese signboard reading “海安杉榫” was hung on its elevation facing the creek, showing that it was for the manufacture of oars and paddles for fishing boats. 4 Tai O Land More valuable than in Central?